Today, my beloved brought me to Asian Twist, a casual restaurant at the corner of Retiro and Speaker Perez streets. Its dishes comprise of fusions of different Asian cooking styles, from Korean, Japanese, Chinese, to Filipino, hence, their sub-name “Fusion Restaurant”. 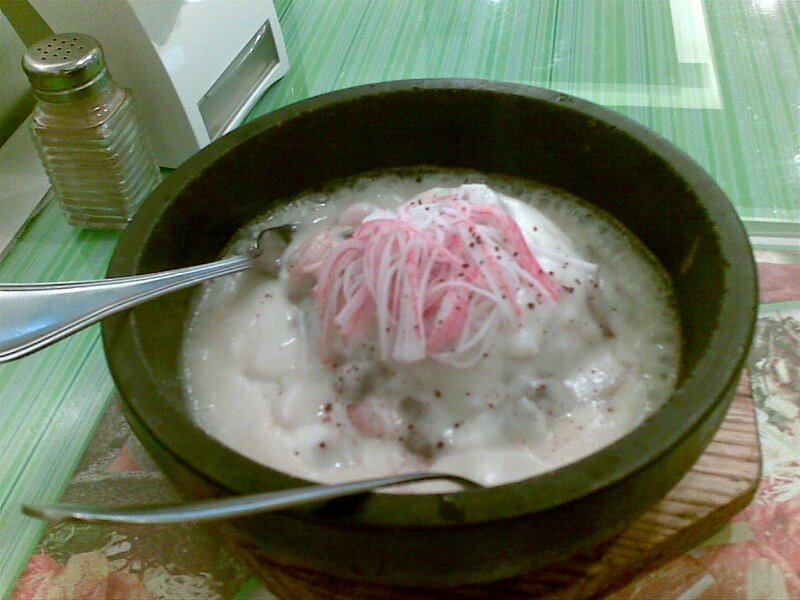 First and foremost, I must say that I do not fancy Korean food. Korean, for me, basically means one of two things: sweet, sesame-flavored barbecued meat; and hot, spicy, fermented kimchi. I despise the latter specialty. Now, I was pretty much aware that when Korean is listed in a menu, it usually has something to do with kimchi. However, seeing as the entire menu either had Korean or “hot and spicy” in its description, and since I was craving a bit of fatty pork, I decided to try out their “Bibimbap Bagnet” (175 Php). Beloved ordered her usual in this resto, the “Creamy Seafood Bibimbap” (175 Php), pictured below. The servings were huge. The waitresses ask you if you would like your bibimbap be mixed, and you should, since they are served in stone bowls and are HOT and can cause minor burns. However, it should be noted the the servings are majorly composed of rice, sauce, and the vegetables. And, yes, this means that for my plate, there’s a huge load of kimchi in it. 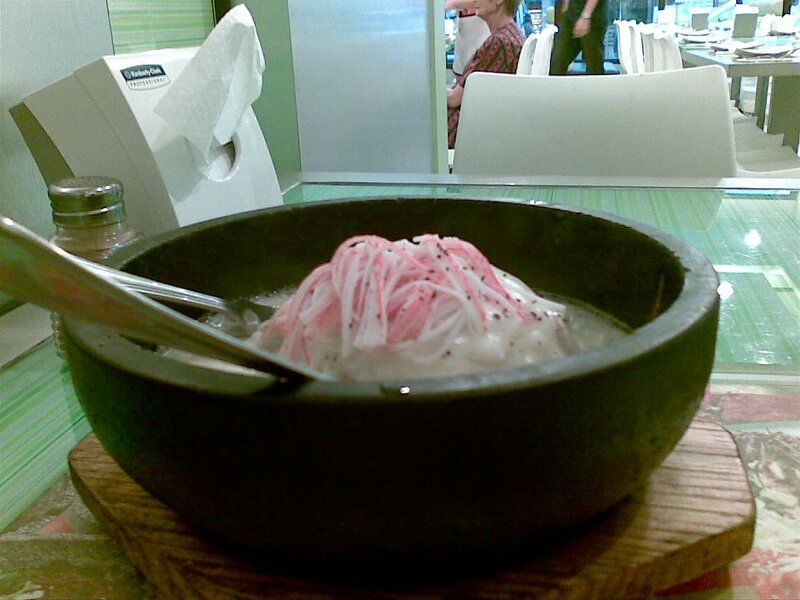 Beloved’s bowl didn’t have kimchi, and instead had shredded crabsticks and mushrooms. The bad part of the meal was that there’s only a few pieces of pork in it. And it’s not even authentic bagnet, it’s more like lechon kawali, or pan-fried pork belly. It’s not a deep-fried meal that has all the fatty goodness trapped within a crunchy popped skin, much like a chicharon. It’s just your usual piece of pork fried in oil without any flavors. They did provide vinegar, but I don’t like my pork sour. However the kimchi basically dominated my plate. Its spicy taste, rotting vegetables, and bright orange color covered almost every grain of rice. 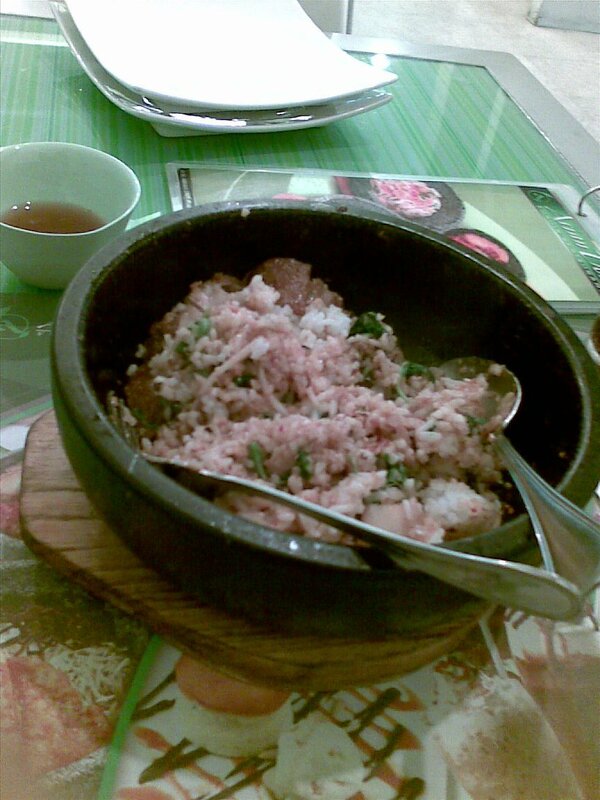 The pork appeared more of a side, and the real main dish of this bowl is the bibimbap. Fans of Korean food would enjoy this dish. I did not. I also had some issues with beloved’s meal. Hers was basically creamy carbonara with rice instead of noodles. The texture of rice with the sauce didn’t really work for me. And like the amount of meat I had in my bowl, the amount of seafood in hers is tiny compared to the amount of rice and sauce. Strange texture aside, this was a good tasting dish. 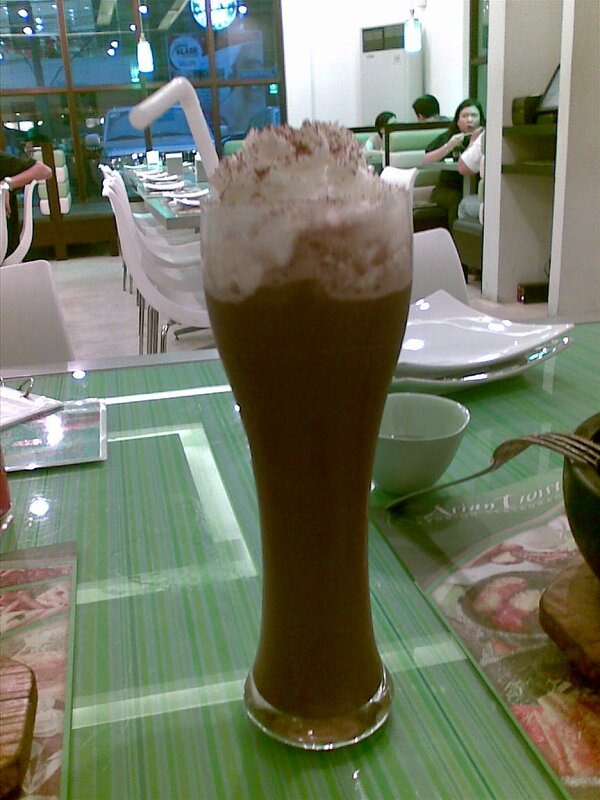 Since I needed something to wash away the pungency from my tongue, we ordered a glass of “Iced Vanilla Mocha” (75 Php). I was expecting a mild, semi-sweet coffee and vanilla flavor. I got a bitter taste on my first sip. When we mixed it, it tasted like your regular tall glass of iced mocha Joe. Now, don’t get me wrong. This is not a bad resto per se, its menu just didn’t agree with me. The fusion of styles is a groovy concept, but maybe I just did a bad choice on their menu. I thought for once it would make me sway my dislike towards kimchi. Sadly, it just made it worse. I wouldn’t recommend this for kimchi haters like me, but those who can tolerate or who love the fermented Korean staple might actually enjoy this. As for me, I’d probably stay away from this resto, as well as Korean food, for quite a while. Location: Retiro corner Speaker Perez St., Quezon city. Recommended for: Kimchi and rice lovers. Not recommended for: Kimchi haters; those expecting plenty of viand on their rice. Smart nomnomnom tip: Do not touch the stone bowl.